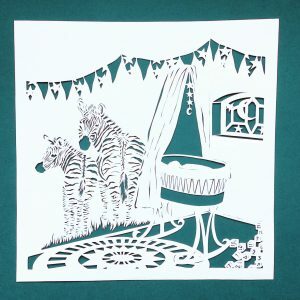 I met Noortje at a workshop papercutting where she told me she was pregnant. After the workshop she and her husband Stephan contacted me to ask whether I would be interested in making the baby announcements for their baby. Ofcourse I was! They really wanted the design for the cards to show the nursery. However, the nursery wasn’t even build, let alone decorated yet… So they entrusted me to visualise their idea of the nursery. 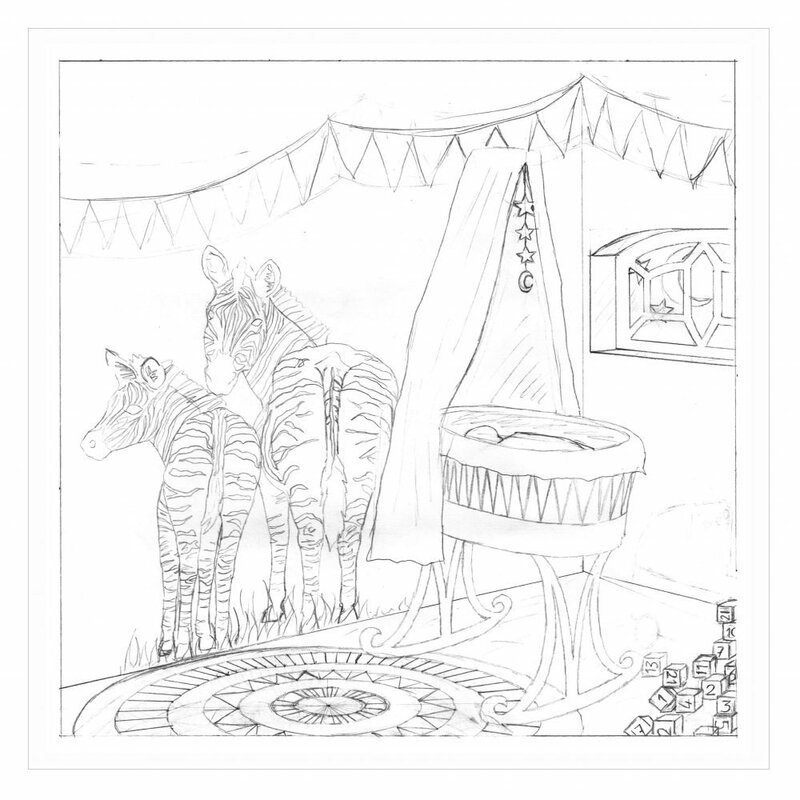 The only things they requested were that I would incorporate a wall painting with zebras, a romantic swinging crib with canopy and a farmhouse window as they were remodeling an old farm into a home. 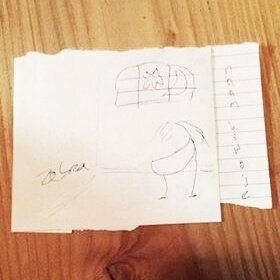 She sent me a quick sketch of what they had in mind. To give me an idea of what they liked style-wise, Stephan and Noortje also sent me a few pictures for inspiration. Which is always very helpful! They said the wicker crib in the picture was similar to theirs, however they wanted curled legs so the crib could swing. The crib on the card was what they visualised for the card. They really wanted the crib to have ornate legs, like rocking chair, and a canopy above the crib. Besides photos of cribs, they also sent a whole lot of zebra pictures as they couldn’t choose. They wanted a whole zebra to be featured and not just a partially one. Noortje wanted just one zebra, but Stephan really liked a mom with her foal. Both really liked the picture where the zebras stood with their behind to the camera. As this papercut would be used as baby announcements and it would be printed, I made the design larger than the final birth announcement cards would be, so the printed card would still have a nice level of detail. To give the design a more interesting look, than just a straight wall and floor of a nursery, I decided to put the crib in the corner of the room, so I would have two walls to “use”. On one I drew the farmhouse window with stars and moon behind it. 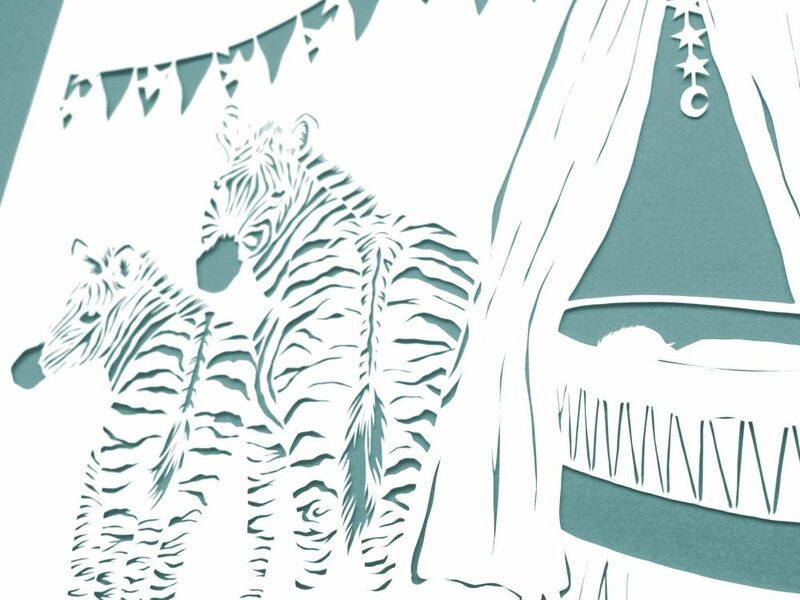 On the other one I featured the requested zebras. I didn’t want to have just standard zebras on the wall and as Stephan and Noortje both really liked the zebra bums, I decided to use those. But just their behinds wouldn’t look enough like zebras once cut, as I don’t have shading to work with. So I had them look behind them, towards the spectator. To have the zebras look like a wallpainting I would cut away their stripes and make their contour that way, instead of cutting away the wall behind them. Otherwise it would look like they are standing in the room (that would be a little weird. 😉 ) The floor looked a bit bare at this point, so I filled it up a bit, to balance the design. I added a few things; a rug, buntings and building blocks with numbers. After approval of the design and when the cutting was done, I sent the piece to Stephan and Noortje so they could work together with their printer to turn it into a birth announcement card. They did a great job designing the baby announcements and framing the piece. 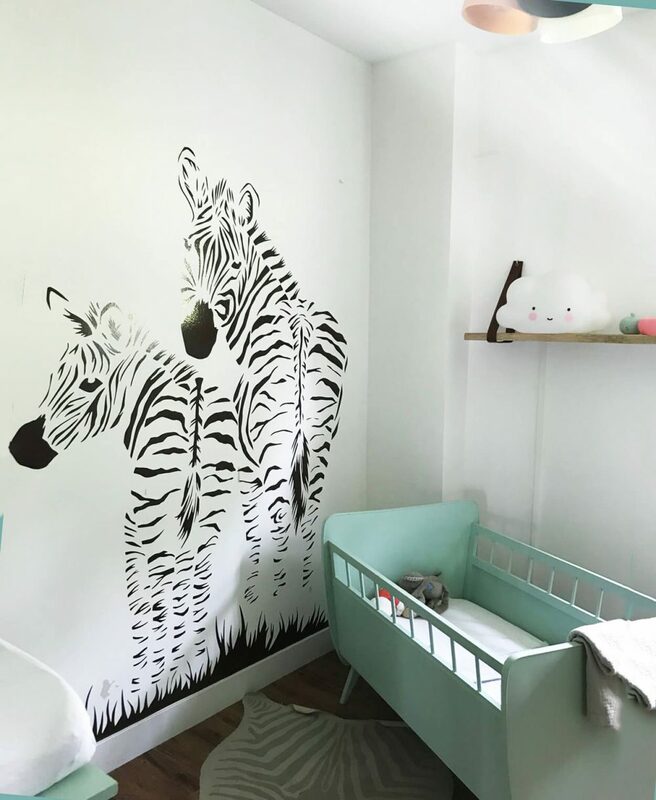 But they did something else amazing with this design; they asked me whether I would be ok if they turned the zebras into a wall sticker. How ingenious is this?! I think it looks so good, even blown up like this, on the nursery wall. What do you think?